Generally just as you described chakras are blocked in a row. Since your three upper chakras seem to be the issue let’s look at possible causes of figuring out which of them is the main culprit. 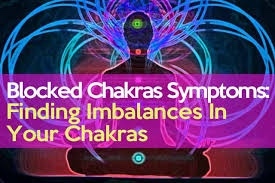 When one chakras is badly blocked often times it will affect the one that is above and below. Starting at the top with he crown, lets determine if there is a problem there. Blockages of the crown indicate an inability to trust oneself and intuition. The connection to the universe or your higher self and perception is not open. Adopting a belief in yourself and your ability to know is important to open up this center. Being raised in an environment where you were dominated or not allowed to trust in your own decision making could cause you to be weak in this center. Being in relationships where you are allowing yourself to be controlled is also another sign of a problem. Take a close look at your present and past situations with people in your life and determine if this was the case. If so, tell yourself that you are going to change this and that you are going to make your own decisions and trust yourself that they are for your highest good. The throat chakra, this one is also tied into being dominated. Are you afraid to speak out? Do you stay silent even when you don’t agree with something in order to fit in? Do you find yourself holding your tongue in order to avoid conflicts? If this is you then you have the reason for your throat being blocked. Make a decision that in slow steps you are going to speak your truth and make yourself known. No more hiding or pretending in order to get along. The heart, the heart becomes blocked when you have been hurt by someone you have loved and trusted. It closed down to protect you from it happening again. You must know in order to fully experience life you must remain open. Look at the reasons that you may have closed yourself off from those who have hurt you. If it was great disrespect, then move on from the relationships and let yourself know that you will not allow that to happen. If you are choosing to remain in these relationships then the rules need to change. When you are hurt you must speak out in order to keep the heart open. There are cases where people hurt us unknowingly and to close off to them is a mistake. We need to communicate in a way that is clear and open. Look at your communication with your loved ones and friends. Do you let them know your true feelings or do you hide them away. Don’t let others be your excuse for closing off yourself to love. To live with a closed heart is to live a lesser life. Now, what can be done. If you have identified that one of these is the main culprit then start with doing a chakra opening meditation and give extra attention to this center. Start at your feet, imagine you have two brown chakras located on each ball of your foot. Picture them in your minds eye traveling like roots deep down into the earth. Now grab on to the center of earth and see the roots wrapping around it like the roots of a tree. Draw this energy up through your feet in to your base or root chakra, it is red, imagine it opening up and spinning clock wise. As you draw the breath up it expands and as you exhale it spins. Continue up each chakra imagining the colors doing the same practice. As you reach your heart spend extra time and attention acknowledging that it is blocked, do the same to the throat and the crown. As you go out of the top of your head through the crown imagine a pillar of light extending up and out of your head and reaching as far into the universe as you can imagine. Now, draw that light back down and send it through each of the chakras and out the bottoms of your feet and have the intention of depositing anything painful back down and release it to the earthly realm where it came from. I do this practice nightly, when you get good at it you will notice that a heavy pulse or energy will be felt where there are blockages. Stay there in the meditation practice until that pulse subsides. Check our my website Your pain is my pain I have several articles on it and one of them talks about your chakras and another about kundalini rising. There are things you should be aware of while doing this meditation that you may encounter. One of them is the awakening of your kundalini energy.